408. Centrolinead for drawing lines toward an inaccessible or inconveniently distant point; chiefly used in perspective. Upper or drawing edge of blade and back of movable legs should intersect center of joint. 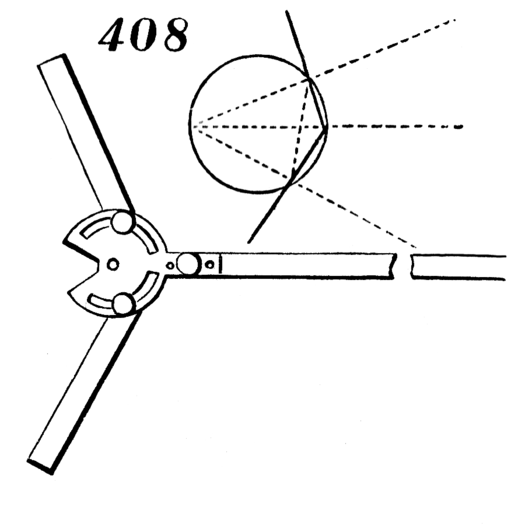 Geometrical diagram indicates mode of setting instrument, legs forming it may form unequal angles with blade. At either end of dotted line crossing central, a pin is inserted vertically for instrument to work against. Supposing it to be inconvenient to produce the convergent lines until they intersect, even temporarily, for the purpose of setting the instrument as shown, a corresponding convergence may be found between them by drawing a line parallel to and inward from each.